Hines Realty won approval from Landmarks to construct a 75-story tower in Midtown Manhattan. Image: Ateliers Jean Nouvel. Commissioners approve proposal, but require additional preservation work for the University Club. On May 13, 2008, Landmarks voted unanimously to allow Hines Realty to purchase developable air rights from two landmarks: the University Club, located on the corner of West 54th Street and Fifth Avenue; and St. Thomas Church, located at West 53rd Street and Fifth Avenue. The purchase will allow Hines to construct a 75-story mixed-use tower in the vacant mid-block lot adjacent to the Museum of Modern Art. Designed by Jean Nouvel, the tower would be occupied by MoMA galleries, a restaurant, a hotel, and apartments. 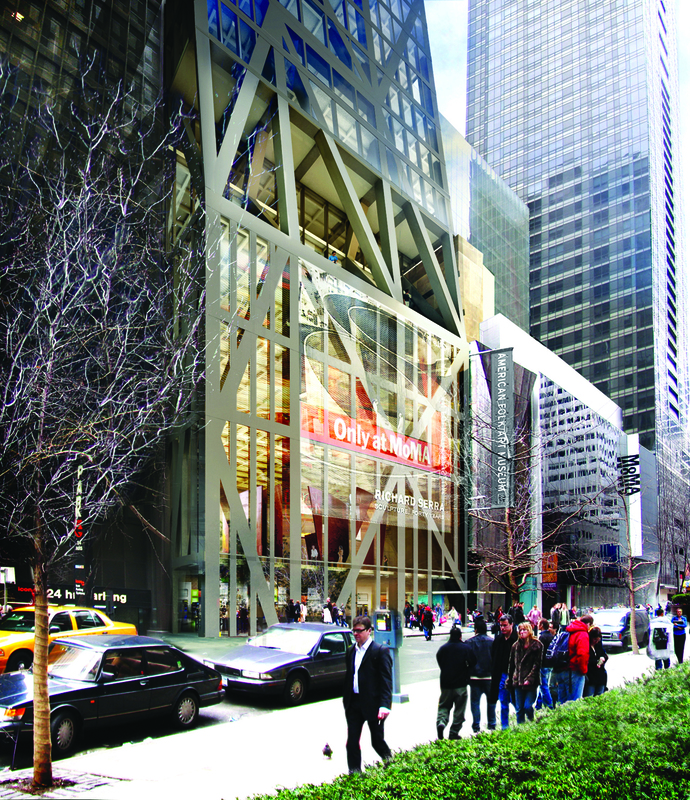 Following a lengthy public hearing on April 8, 2008, at which elected officials and local residents raised concerns over the impact of the large-scale development on nearby landmarks and traffic congestion in Midtown, Landmarks held another hearing on May 13th to allow the applicants and MoMA to respond. 5 CityLand 60 (May 15, 2008). Representing MoMA, Michael Sillerman of Kramer Levin emphasized that the proposal fulfills the zoning resolution’s requirements governing such a sale. Specifically, that the new building must be of a design that creates a “harmonious relationship” with the landmarked building selling its developable air rights. Sillerman argued that the proposed tower would not significantly impact St. Thomas Church or the University Club in any adverse fashion and is, therefore, legally sufficient. Testifying for St. Thomas, Melanie Meyers of the law firm Fried Frank Harris Shriver & Jacobson, stated that the proceeds from the developable air rights transfer would go toward restoring all 36 of the church’s stained glass windows, as well as repairing the stairwell, roof, and stonework. Representing the University Club, Robert Davis, from the law firm Bryan Cave, stated that his client would use the proceeds from the air rights sale to perform window and roof repairs as well as install a central air system. While Landmarks praised the proposal by St. Thomas, Commissioner Stephen Byrns suggested that the University Club should also restore the building’s balustrading, which has remained covered since a street widening in the early 1900s. Before holding a vote, Landmarks Chair Robert B. Tierney incorporated Byrns’ suggestion and recommended approval of both proposals, noting that to do otherwise would unfairly punish owners of landmarked buildings who had properly maintained their buildings. Landmarks then voted to approve both proposals. LPC: St. Thomas Church and Parish House, 678 Fifth Ave., Manhattan (COFA# 08-6392) (May 13, 2008); The University Club, 1 West 54th St., Manhattan (COFA# 08-6382) (May 13, 2008).